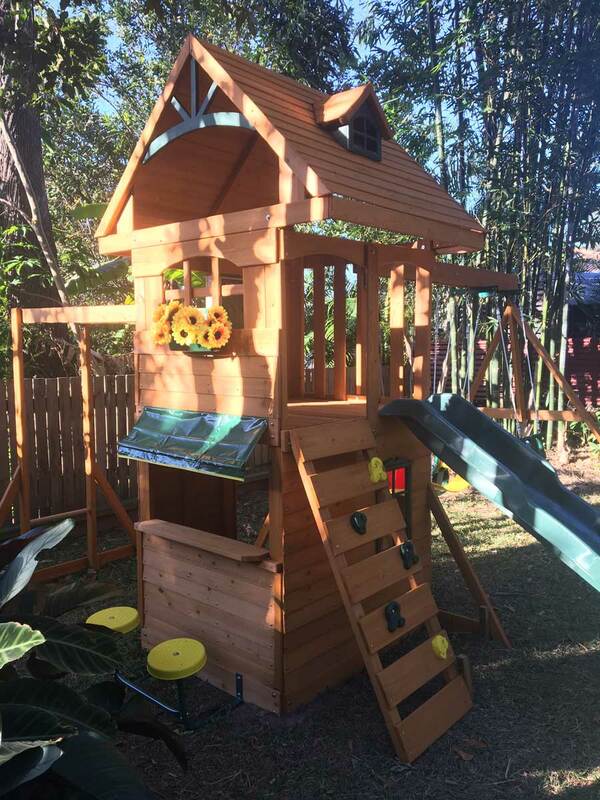 The Ridgeview Deluxe climbing frame is constructed with cedar wood due to it being soft to the touch and naturally resistant to rot, decay and infestation. 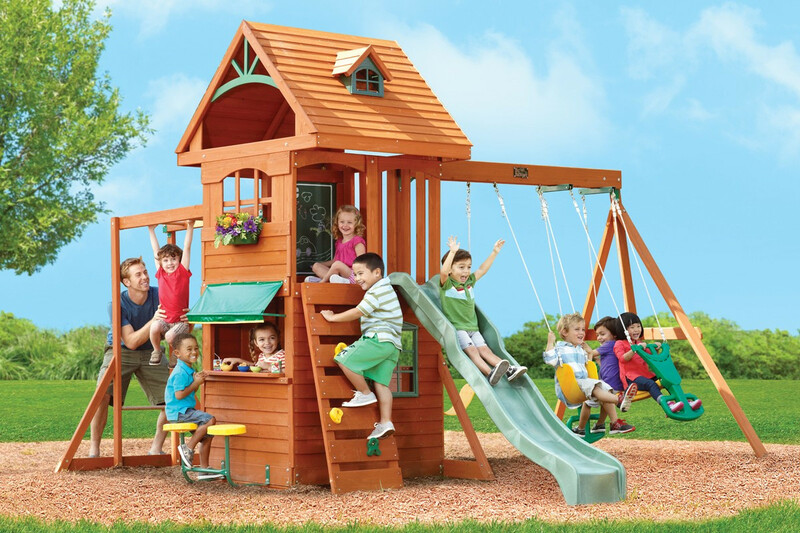 The frame includes a pair of belt swings and a two child glider, the fort has a rockwall climbing ladder and slide attached with monkey bars at the rear of the frame. The lower cubby has a serving area with cafe seating. 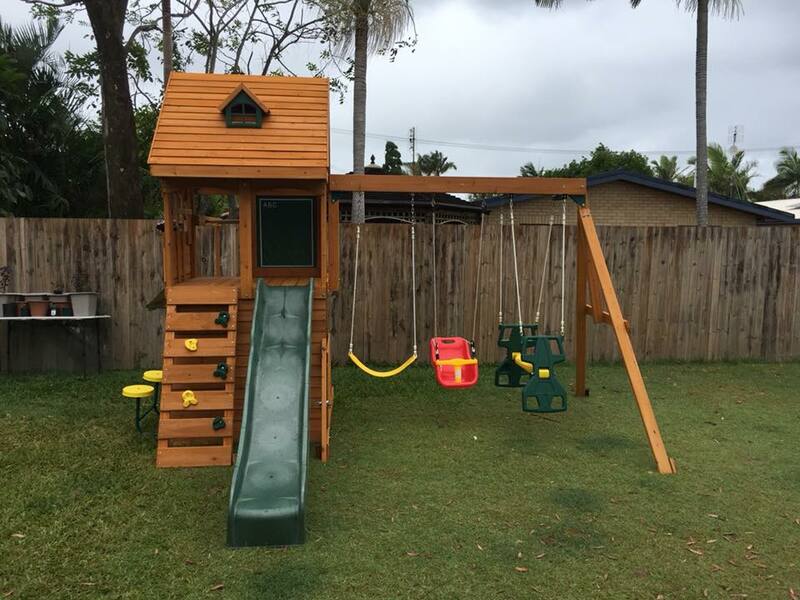 The Ridgeview Deluxe climbing frame's 120cm high play deck is accessed by a slatted rockwall with multi-coloured climbing rocks or the monkey bars. Monkey bars are a firm favourite with the little ones and the positioning of these at the rear of the frame means your garden doesn't have to be huge to accommodate them. Outside the window of the upper play deck is a flower box which could be used to grow a small herb garden. 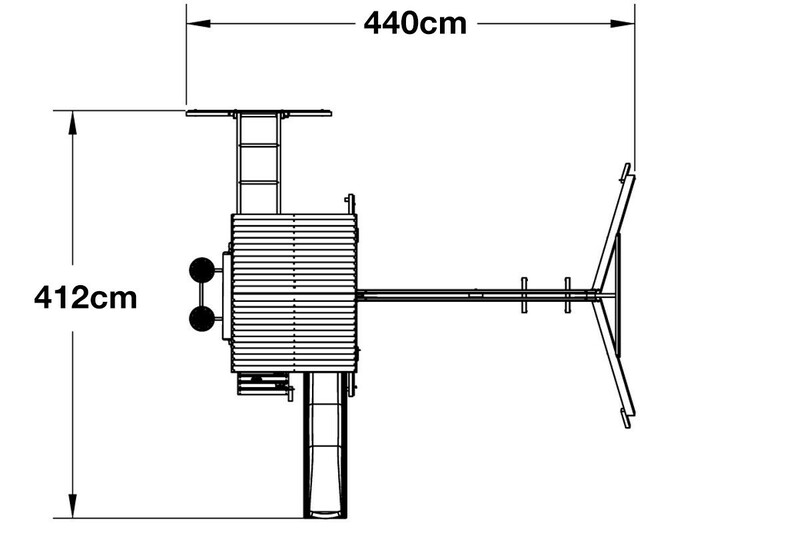 The upper playdeck measures 98cm x 118cm. 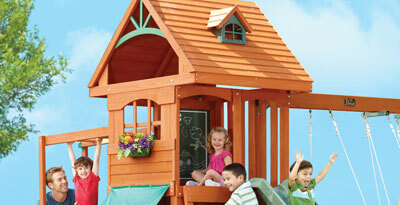 The Ridgeview Deluxe climbing frame has a 3 position swing beam with 2 belt swings and a 2 child glider. 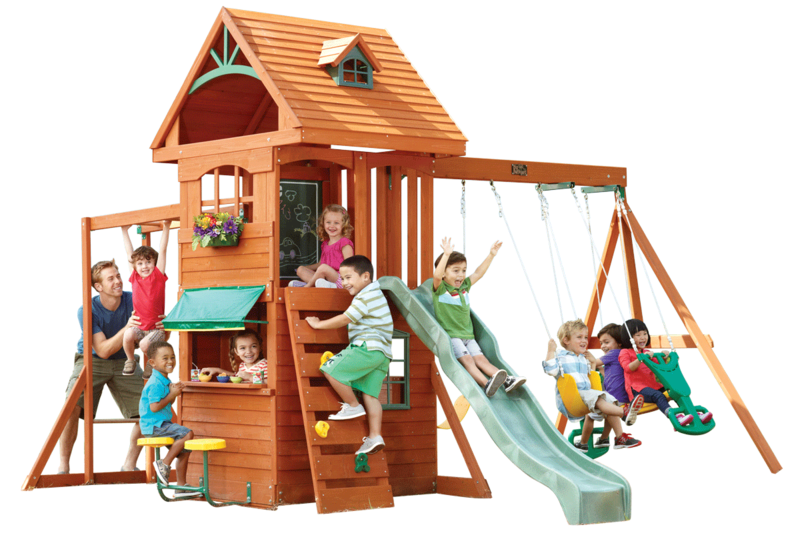 This is great if you have several children wanting to use the playset at the same time. The belt swings are made from a flexible plastic that molds perfectly around the occupant to provide a tight, secure and most importantly a comfortable seating position. The slide on the Ridgeview Deluxe is made from a durable, UV protected HPDE material to provide strength and stability. 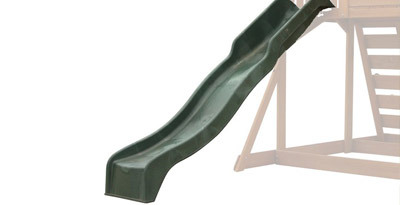 The slide features raised edges to provide an extra layer of security for your children when sliding. 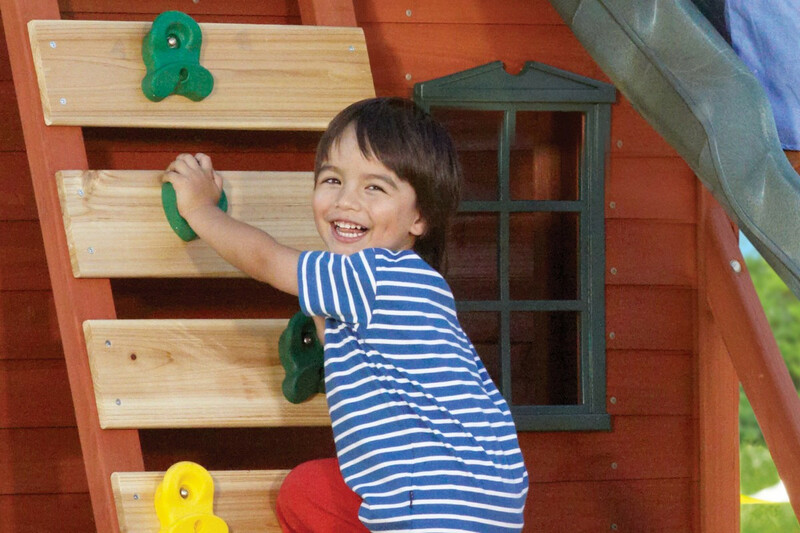 These raised edges are increased at the top enabling your child to get a firm grip as they look to start their decent back to terra firma. 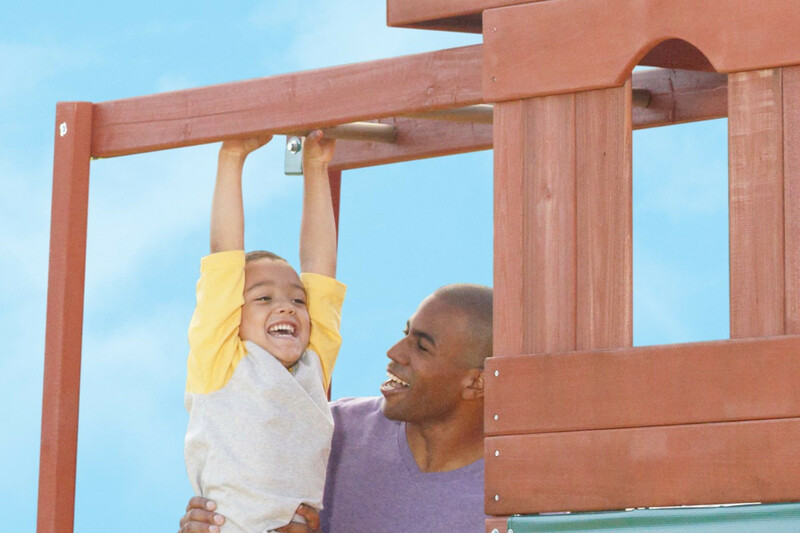 There are two fantastic climbing features on the Ridgeview Deluxe climbing frame that will help to keep your children busy; these include the rockwall climbing ladder and the monkey bars. 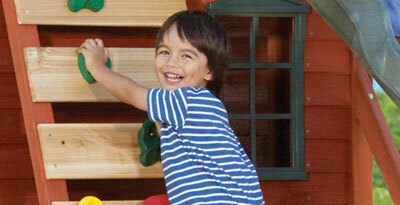 The rockwall ladder is perfect for all children no matter their climbing ability. Open slats on the rockwall enables this to be used as a ladder, while more advanced climbers can make use of the rockwall mounts. The lower playhouse is completely enclosed with small windows to the front and a large serving hatch at the side with 2 café stools attached to the outside. This is where your children can rest and recuperate if they get tired from all the excitement. There is also a fantastic chalk-wall on the upper fort deck where you children can rest, take five and sketch out some great drawings. 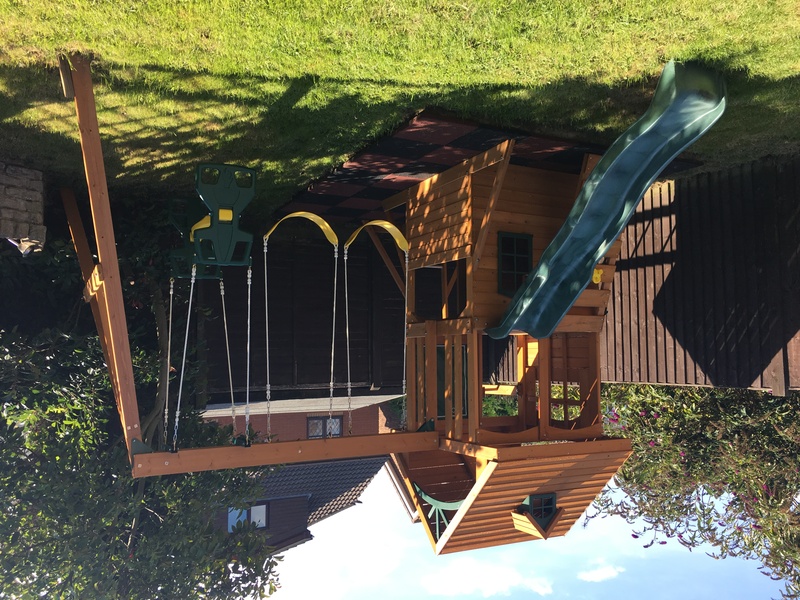 The Ridgeview Deluxe climbing frame is pre-cut, 90% pre-drilled and pre-stained which helps make home-build as easy as possible. We also supply an illustrated owner’s manual showing you exactly how to build the set. 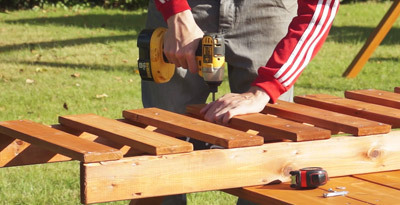 All you’ll need is basic DIY tools. 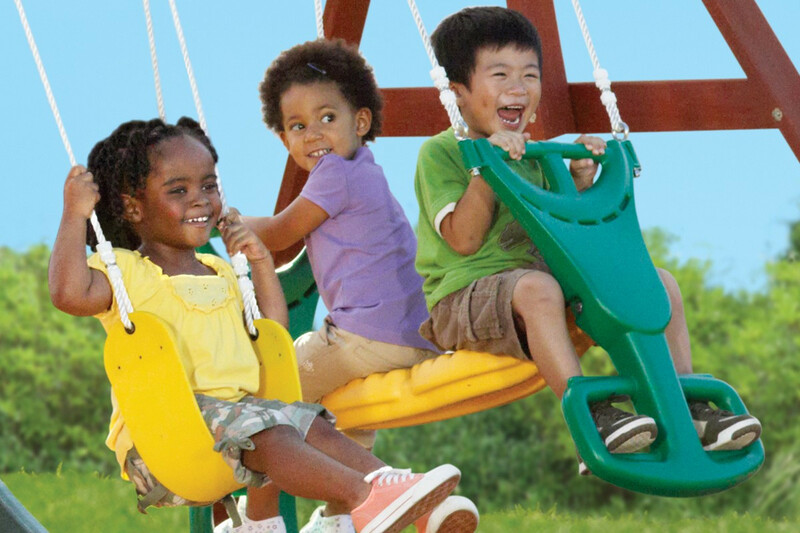 This frame is designed for children aged between 3 and 10 years of age and is tested (EN-71 & ASTM) to meet requirements for private residential use – this set is not suitable for commercial use. Initially when I had a look at the installation manual I freaked out. We didn’t know where to start. The customer support team were so helpful they gave us videos to watch to help with assembly. We have spent all of Saturday installing it and have a bit more to go but all the wood pieces are numbered and everything is very organised. Still have about half a day more to go but I can see the kids loving this! Thank you for the fantastic service and support. You have a great product here. My daughter was lucky enough to receive the Ridgeview Deluxe set for her recent fifth birthday. Ordering was quick and easy and any questions were very swiftly answered. The live chat feature is extremely helpful and fast with excellent and accurate information provided, no pre-programmed responses like you can experience on other sites. Despatch and shipping is fast and tracking is accurate. The set arrives in very few boxes which is intimidating at first, however the pieces are well numbered and the instructions very detailed and clear. The estimated time frames are accurate so I wouldn’t recommend underestimating the task at hand if you are limited on time. The finished product is a sturdy, exciting and attractive set. 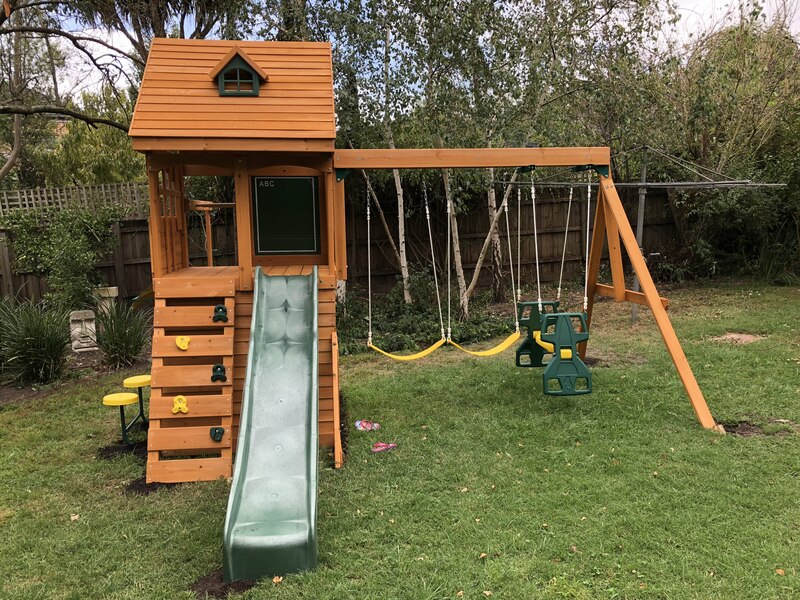 I had my concerns of it overpowering our yard but I was very pleasantly surprised that the final result was compact, the space well utilised and completely appropriate for backyard fun. Unfortunately our slide was damaged in transit to us, but organising a replacement was painless, fast and so easy. After providing a photo there were no questions asked and the replacement turned up only a few days later. Throughout our purchase we have found the customer service to be up there amongst the best we have ever received. The after sales care is genuine and you can tell the company completely backs the products they sell. I am more than happy to recommend this company and its products to anyone and everyone. The quality, service and value are second to none and the decision to purchase, is not one you’d regret. Thank you to all the team who assisted me in receiving this in time for my daughter’s birthday, it made an unforgettable present which will give her plenty of joy for years to come. Thank you so much!!! 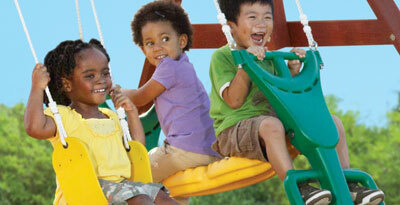 We are so pleased with our playground and what it means to our children. Many hours of fun an memories to be made..The whole process was so easy. The layby option is fantastic meant we could get a bigger one. Was easy to collect from pick up point.Putting it together was relatively easy the instructions were very easy to read and follow making it straight forward process. We made a few additions like chalk board, handles and a few extra but the playground itself is unbelievable sturdy and the end result is beyond words.. Thank you very happy customer!!!! 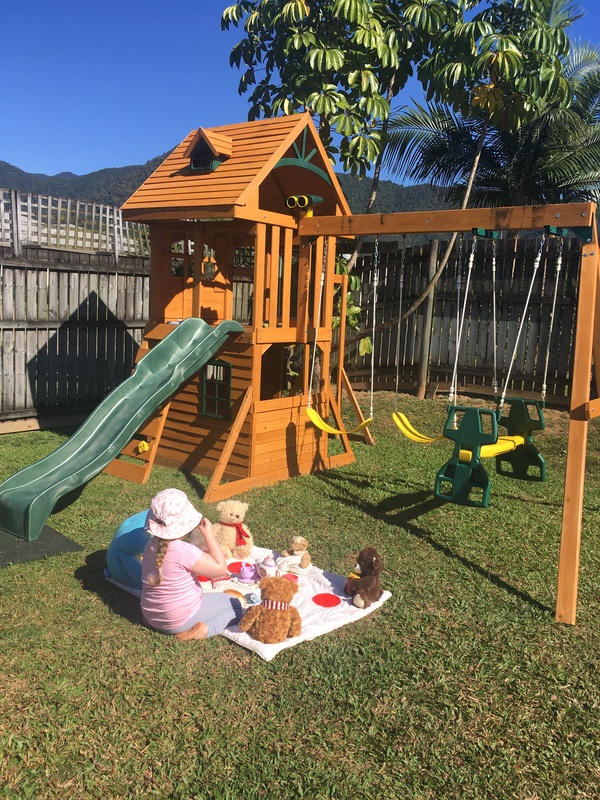 Firstly I will like to say the Ridgeview Deluxe climbing frame is a fantastic playset and my 3 and 7 year old daughters love every bit of it. ClimbingFrames also has a wonderful customer service. I accidentally cracked one of the pieces while assembling and they replaced it for free after I emailed them. They even paid for the express postage and I was very impressed by that. I personally am not a very handy person with my experience limited to assembling IKEA furniture. Overall I spent about 38 hours putting together the playset mostly by myself when the instructions state it is a 10-14 hour for two person assembly. Even though they said the holes are "predrilled" but in reality it is only half of them. For instance, in the rock wall assembly, there are pre-drilled holes on the rock board but there are no holes on the long side rail. Ultimately it is up to you to make sure that things line up and the frame is straight and square. If you are not used to wood work or are paranoid about things not being straight, be prepared to spend a bit more time. It will be nice if all the holes are pre-drilled like IKEA products. This is generally not an issue but this is made worse when the QC of certain parts is less than ideal. For example for the roofing, the roof pieces are of varying length. The roof support is quite mobile when you put it together and if the first few pieces you screwed on to secure the support are slightly shorter, then the last few pieces may not fit. I found out the hard way and ended up have to take the roof apart a few times. The same goes with the wall siding. I had followed the instructions and made sure the pieces are flush with each other but I ended up with a small but unsightly gap at the end with the last piece screwed on. Another example is with the roof frame assembly. As you can you from the imaged I attached, there is a defect/hole in the wood where the screw is supposed to go in. I simply drilled another hole for the screw but it is a QC issue nonetheless. One last example is the floor joist for the for frame. The instructions state you need to make sure the frame is square and flat. Yet the predrilled holes to attach the floor joist are not even straight. Maybe I am over-reacting with the QC. Some may say it does not matter at the end of the day and the fort or the roof is not going to collapse when things are not perfectly straight or square but personally I find it irritating and annoying to say the least. Lastly if the timber ground stake can be replaced with metal ones, that will make life a lot easier. But despite all the issues during assembly, my two daughters absolutely love the play and have spent many after school and after dinner hours on the playset. One of the best flat packs I have ever seen!! So well put together. Removed everything from it's boxes and double checked everything was there, sweet. One of the best things was the fact that there were extra bolts and screws etc in case you needed more or lost some. Why don't more do that? Took a couple of hours on a Saturday, most of Sunday and a an hour on Monday to get it all together. Pretty easy construction with a few minor confusing parts. 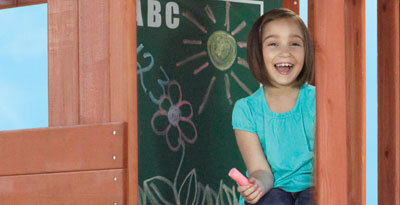 All in all, a great product that the kids will love for years to come. My 3 year old daughter has had great fun playing on this. We had a concrete slab in a corner of the garden that we wanted to make use of. This site was great for checking the exact measurements so we were sure to get something that fit the space we had. It is tricky to put together, think flat pack difficulty x 10. All the pieces are clearly marked but they are pieces, unlike some other playgrounds there are no pre assembled panels. This has been in our garden for 6 months now & my daughter hasn’t lost interest. It has weathered well so far, just a couple of discoloured boards & a couple of warping feather boards (easily fixed with a couple of extra screws). I’m confident this will last several years. Detailed instructions which are relatively easy to follow. There's a couple of flaws in the design; the "chalkboard" is really flimsy, and there's nothing at its back to give a nice finish to the frame. I rectified this by buying a proper chalkboard and getting extra cladding to finish the frame properly - as the photos show. I bought the "baby swing seat" to make the frame more suitable for my little one. 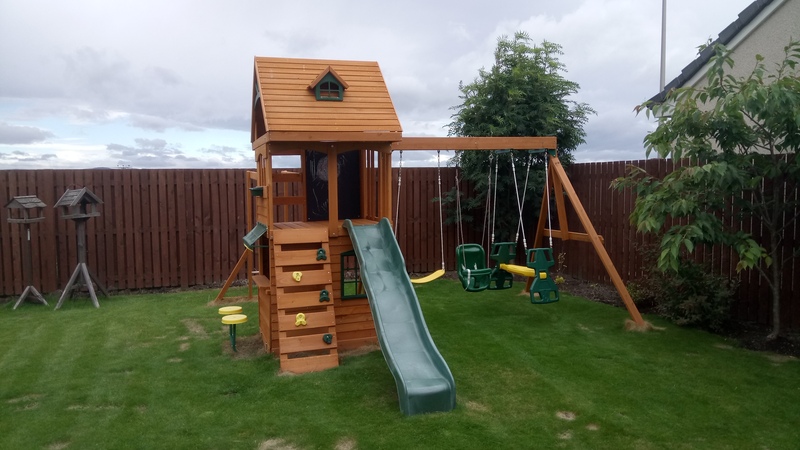 The frame looks great, sits nicely in the garden, and my little one loves playing in it - on the swing, up the rock ladder and down the slide, or in the ground floor area and seats outside. This is a great purchase, and I'm sure the other frames are too. Couldn't be happier with this product, I was a little sceptical with the build time stated when I opened the boxes but we managed to get it done with 2 people in the time advised. I did the inventory one evening and spent time putting all the timber and nuts and bolts for each step into little piles. This took 2 hours BUT it made the build so simple, it was also cool seeing our progress. Slowly but surely our piles started to disappear! All in all, since putting it up this cubby has bought nothing but joy to our little ones life. Very happy with the investment. Great service & delivery! Love the climbing frame ! Would recommend! Unpacking this product was a bit daunting given how many pieces were there - I read the instructions through once (recommend that one!) and away I went. Took two days to build, the instructions made it so simple and were very easy to follow and so on that score this product gets a big thumbs up! I concreted the supports in as we get big wind storms, and the structure has taken a real pounding with no damage whatsoever, so I'm happy with the quality of the components. The kids just love it and it is a real bonus for us to be able to let them play at home so we don't have to make the big effort of packing up the car and going to the park. Considering what we pay for cell phones and TV's these days this is a really worthy investment in my children's happiness!